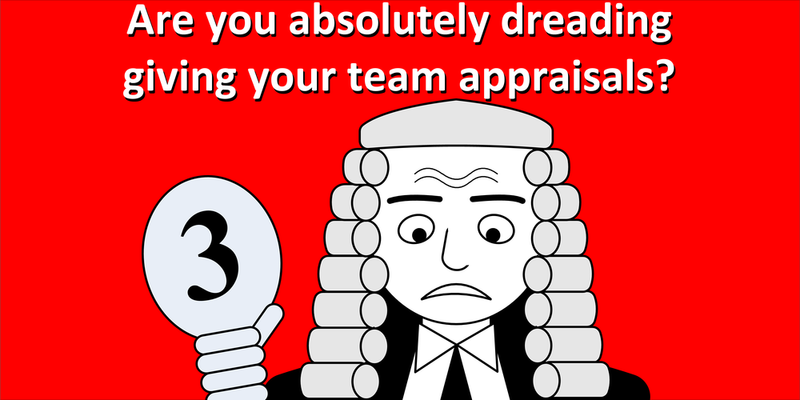 Are you absolutely dreading giving your team appraisals? It’s tough to work closely with your team all year and then have to judge them. You are right to dread it, even hate it. Having striven all year to build up trust and rapport, the organisation is forcing you to be critical of them. Now let me think… is that REALLY going to increase their motivation, creativity and performance? Hmm… Maybe not. Staff performance appraisals have long been a widespread practice, which doesn’t make them any more worthwhile or less damaging to both people and performance. That great management guru, Dr W Edwards Deming railed against ‘Evaluation of performance, merit rating, or annual review’. It was one of what he called the deadly diseases of organisation due to the Western style of management. So concerned was he about the practice that he devoted nineteen pages of his classic book Out of the Crisis to its ills. So what’s wrong with Performance Appraisals? You mean apart from making you feel bad, either as a manager or as the subject of appraisal? Do you really like judging or being judged? I thought not. Likely when you experienced appraisal you have felt you were being blamed when many factors were outside your control that affected what you were able to achieve. Appraisals, the rating and ranking that can follow and, annoyingly, the often linked bonuses or pay rises, fail to recognise that too many factors affecting performance are beyond an individual’s control. These include the effects of random chance, i.e. just plain bad luck. So how will your team members be feeling about appraisal? In reality everyone is part of a greater whole-system of interconnected influences that affect performance. High performance is the outcome from interactions of people with their environment and who are working together effectively communicating, cooperating and, especially, collaborating. The environmental influences will be from both within and external to the organisation. So while people can make a difference themselves, it should be obvious that individuals are therefore subject to multiple influences beyond their control. The problem with appraisal is that it is an outcome of the widespread practice of Mechanical Management, which believes in reward and punishment. Do X and you get Y. When you apply this to people in organisations it will be counterproductive. In fact whilst you may see some visible results what you will not see are the unexpected side-effects; like fiddling the numbers or system and demotivation. Primarily, and most obviously, people are not machines. They are thinking, feeling, and social beings. They do things for their reasons not for yours. If you beat them up they WILL go into self-preservation mode and become demotivated. Person is set against person and team against team. Hardly a situation that delivers the motivated, creative, innovative and high performing teams you want. What an organisation should encouraging, as mentioned above, are communication, cooperation and collaboration that lead to creativity, innovation and, ultimately, high performance. OK, so not everyone receives a bad review. However, just as the whole-system of influences can produce a poor rating the same factors may combine to create positive conditions. Yes there are high performers who have produced outstanding results. They may well have developed the knowledge and capabilities to work more effectively. I would suggest that they present the opportunity to learn what conditions others need to also deliver high performance. Our learning should also take into account that people are different from one another. There is no one-size fits all in people’s capabilities and aptitudes. Indeed I would argue that it is the variety between people in a team that can lead to great outcomes. One must consider very carefully before rating people as high performers. Will it bring the team closer together or drive them further apart harming communication, cooperation and collaboration? If appraisal is part of outdated mechanical management thinking what is the alternative? The primary job of an effective manager is to behave and inspire in a way that lifts their team. To be effective you don’t have to be an expert or specialist, although relevant knowledge of the field can make a difference. Great sports coaches, film directors or orchestral conductors might not be star players or performers themselves. However, firstly they are able to bring together a team of people with the relevant knowledge, experience and skills. They then help them work well together in the right conditions; those that release their highest creativity and or performance. And it is in particular with respect to helping people to work well together and creating the right conditions for people to give of their best that performance appraisal fails most. We’ve looked at the negative effects of performance appraisal and the blame, stated or implied by a poor appraisal outcome. Let’s listen to what someone feels like in a positive working environment? "I feel trusted and valued, so that part is very good. The words of Formula 1® (F1) racing driver Kevin Magnussen who drives for the Haas team. In the 2018 season he achieved his best position in the drivers’ World Championship of ninth after five years in the series. When you look at Magnussen’s results earlier in his F1 career they took a dive in 2015 after a promising start in the McLaren team in 2015. The poor performance was not a function of his driving but that of the new Honda engine, which was returning for its first season in F1 to new regulations after nine years away. No amount of appraisal could compensate for a poor performing engine. Magnussen was replaced at McLaren-Honda by double World Champion Fernando Alonso. Even with all his ability and experience Alonso could not compensate for a poor engine and, as it turned out, a really poor car. As an F1 fan I am also going to be interested to see what affect newly appointed Ferrari Team Principal Mattia Binotto will have on the that team in 2019. Jonathan Noble, in a 17-Jan-2019 article on autosport.com, said that in earlier roles Binotto created a more horizontal system in which all staff had a greater say in how things were done, and were more able to contribute to the decision-making process. He trusted those underneath him releasing their abilities rather than them fearing blame. As a manager your team can develop and progress when you provide effective leadership. An essential part of this is that whilst being responsible for all areas you show trust to all members of your team. Business, education and public sector organisations succeed through cooperation not competition. As the examples above illustrate one can see, however, that even in competitive sport a positive environment and enjoying what you do is an advantage. More and more today managers are using whole-system thinking to see the world as a place where, as stated above, everything connects to everything else. This recognizes that there are multiple influences and consequences, both seen and unseen. Critically causes and effects are often separated in time and sometimes space so the relationships or connections are not always visible. How will developing your whole-systems thinking ability help? Bluntly it should immediately cause you to stop looking for someone to blame when things do not work out as expected. It helps to start really listening and learning about what is happening. More than likely if you are experiencing low performance, some undesirable effect or mistake then it is quite possible that it originates from some external cause and not your team. Once you accept the implications of whole-systems thinking you may be open to seeing the source of some event or behaviour may be the higher level environment external to your organisational system. It may also be down to you! Do you need to do things differently? When you actually see, hear or experience something yourself that you need to feedback to one of your team, do this as accurately, clearly and as soon as practically possible. That feedback should be in the form of the title of Marshall B Rosenberg’s book Nonviolent Communication. This is a topic that deserves greater space so I’ll reserve that for a future blog. Consider whether performance appraisals are really helping… well are they? Possibly, for the record substitute an ‘Annual Piece of Paper’ (APoP) that they write. Newer PostAmbulance - Is your business still breathing? Apr 1, 2019 Ambulance - Is your business still breathing? Feb 18, 2019 Are you absolutely dreading giving your team appraisals? Sep 6, 2018 Trouble with Numbers? Jun 11, 2018 Managers Need to be Aggressive, Right? Feb 17, 2017 2F15 What Influences Your Business Success? Feb 7, 2017 2F14: Is Improvement Your Trump Card? Jan 31, 2017 2F13 Ever Played the Numbers Game to Look Good? Jan 23, 2017 2F12 Do You Use Data to Improve Performance? Jan 16, 2017 2F11 How Is Your Performance Measuring Up? Dec 21, 2016 2F10 Wozappnin? Dec 12, 2016 2F7 Are You Motivated To Do This? Dec 12, 2016 2F6 Cost Cuts Don't Cut It! Nov 16, 2016 Waste: Time is Money! Nov 9, 2016 Does Your Customer Value Flow? Nov 3, 2016 Is yours a customer-focused business? Oct 24, 2016 Customers? We have customers too? Oct 10, 2016 Find making plans work tough? Sep 28, 2016 Is something happening? Sep 15, 2016 Leading from the biggest picture? Sep 6, 2016 Incentives work, right? Aug 26, 2016 Culture Change Programmes? Aug 19, 2016 Innovation is flash, bang, wallop isn't it? Aug 15, 2016 Productivity: People, Policy or Process? Aug 10, 2016 Improvement for nothin' and performance for free? Jul 13, 2016 Data? Wiggly Lines? Improve for Free? Nah! Dec 3, 2015 Use Less Energy; Less Climate Change? Sep 15, 2015 Will you take a moment to remember? Aug 28, 2015 Can Bullying Build Trust? Aug 7, 2015 One Thing Leading to Another?